I train regularly as a body building woman & have stronger than average upper body strength, should I go with what feels comfortable even though it's a higher poundage than you recommend for a beginner female? The important factor that needs to be pointed out is that the light weight bow recommendation is for beginners who have no formal archery instruction or coaching. The purpose of a light draw weight is to prevent over loading the archer so they can learn proper shooting form and shot execution without straining or becoming fatigued too soon. Proper shoulder, elbow and wrist alignment as well as core control and posture are difficult to learn under heavy loads. Learning to use the back to draw the bow as opposed to using the arms is a technical challenge even for experienced archers. Joints, ligaments tendons and muscle need to be conditioned, strong and stable in order to have good control. If the archer is “over bowed” (draw weight is too heavy) then the learning experience will be hindered. You’re a body builder - no doubt you have good upper body and core strength. 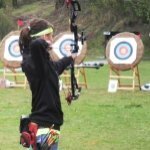 If you have good motor skill and range of motion without impingement in the shoulder, neck or back then I would say it is safe to choose a higher bow weight than what is recommended. 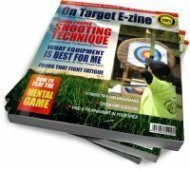 My advice is to choose a draw weight that is no more than 6 to 8 pounds more than suggested in the chart until you have a firm understanding of all the dynamics involved in proper shooting technique. Even well trained athletes can injure themselves particularly if you do not have a good instructor or coach watching out for you. And welcome to the wonderful world of archery. Join in and write your own page! It's easy to do. How? Simply click here to return to S1-6 Proper Draw Weight.